Imagine that the city could record the thoughts and memories of the people who live there. So that as you walk around the streets and squares of Graz, you could hear voices talking about the artwork that was and still is around you, artwork from the forty years of the steirischer herbst. Fortysomething is a project that makes this possible. 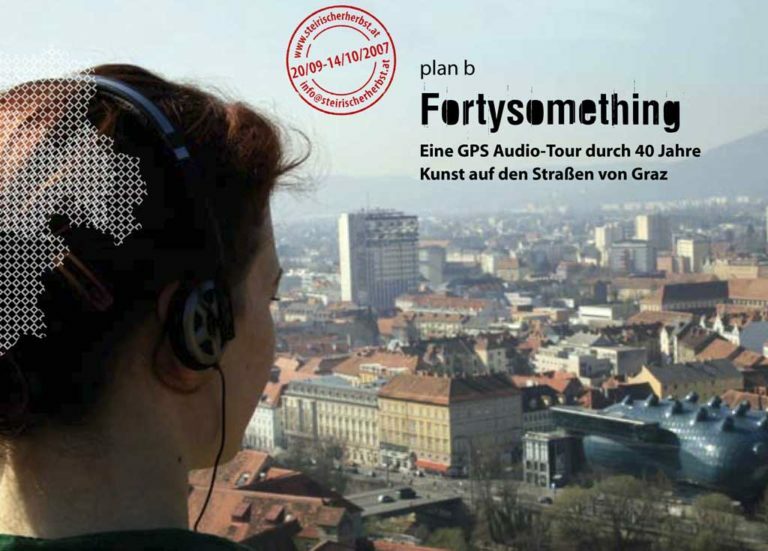 To celebrate the forty-year anniversary of steirischer herbst, we created a GPS-triggered audio scape that charts, investigates and reveals the events that have taken place on the streets of the city during the festival. Public art, sculpture, happenings, performances and concerts were commemorated in the places they happened through the voices of those who were there. Previous festival directors, the artists and those involved in the pieces as well as passers by have been asked to add their memories to an aural landscape that the festival visitor can navigate as he/she explores the city. We collaborated with the journalists Anna Katharina Laggner and Johann Puntigam to collect the different stories and comments that make up the project. Each listener could have a different experience of the piece determined by where they choose to walk and the precision of the GPS reception on that day. All in all, over forty people were interviewed and the user could encounter over nine hours of interview clips. Clearly this was impossible to experience in one session – nine hours is audio material alone without walking in between and the iPAQ battery wouldn’t last long enough even if the user did. As the project was free to do, it was intended that the interested user could visit more than once to go into the project deeper. The listener received a bag especially designed by Heidenspass with the GPS receiver and a Personal Digital Assistant (small handheld computer) that they could then walk around the streets with. This equipment responded to the location with the appropriate sound recording. All the user needed to do was walk to find the stories, staying on the spot to hear the whole recording or moving away to find another. In addition, they would also receive a booklet of images from the past years of the steirischer herbst with a map defining the areas where sounds, stories and interviews could be found. The software (Mscape, created and supported by Hewlett Packard in Bristol) allowed us to layer up several sound sources within one area so that each time that place was re-visited new things could be heard. Also as a listener left a region, the sound would fade out but would start again from the point where it left off if the region is re-entered. By no means did we aim to cover everything that has happened outside in the last forty years but rather to respond to the people who were prepared to add their voices to this audio scape and create an auditory landscape of experiences, memories and voices. how can i experience the project? The project is now housed at the Büro der Erinnerung in the Joanneum. Peter Ablinger, Sabine Achleitner, Emil Breisach, Werner Fenz, Christine Frisinghelli, Florian Geßler, Manfred Goger, Karl Grünling, Eva Maria Hofer, Herwig Höller, Christian Klein, Alfred Kolleritsch, Erika Lackner, Anna Katharina Laggner, Anton Lederer, Florian Malzacher, Sylvia Mascher, Krista Mossböck, Warren Neidich, Norbert Nestler, Friederike Nestler-Rebeau, Fritz Ostermayer, Andreas R. Peternell, Karin Polanz, Doris Psenicnik, Hannes Rinnerhofer, Anne Schulz, Mårten Spångberg, Dieter Spath, Eva Maria Stadler, Franziska Stiger, Helmut Strobl, Lisa Strömbeck, Reini Urban, Peter Vujica, Thiemo Waltensdorfer, Sigrid Weiß-Lutz, Peter Wolf, Siegmar Zacharias. The project is generously supported by Hewlett Packard, Bristol who have leant 20 iPAQs for the duration of the festival and the mscape https://www.mscapers.com/team who offered advice, software support and programming help as well as Heidenspass who designed and made bags for the project. We would also like to thank Peter Göhler for lending us the headphones for the project. fortysomething was a steirischer herbst commission.